WARNING! THIS IS A GEEK LEVEL III ARTICLE. It’s about testing, not image making. If you’re into geeky testing stuff, you’ll probably find this fascinating. If you’re not into geeky stuff but are into how lenses change over time, you’ll find skimming it worthwhile. If you’re a Fanboy or Fangirl, there’s nothing here for you; there are no brand comparisons. In a previous post, I wrote about the idea of rapid MTF Testing and how we got there. The three or four people who actually read it thought it was cool. We already had arguably (really it’s not arguable, but people like to argue) the best lens testing system available. But the test time was too long to test every lens after every rental. We tested a given lens every few months using our MTF system, but day to day used test-charts and lens projectors. The Rapid MTF system is a ‘through focus’ test, so it shows lens performance in 3 dimensions; it detects tilts and decentering better than a chart or projector can. It also gives measured numbers at multiple points so we can keep the data for every test of every lens. For the first time, we can look at how a given copy has tested multiple times over several months. Plus, there are, you know, numbers. “It dropped from 0.76 to 0.64” has more meaning than, “I think it might be softer than last time.” Of course, there’s no way one of our techs, testing 200 lenses a day, would possibly remember what it looked like last time. After a year of development and a few months of beta testing, we knew that the new testing method worked. But we weren’t sure how much better it would be, or what other information it might give us. We’ve been using it for months now, tested thousands of lenses multiple times, and learned a lot. Some of what we learned is about how much this improved our testing. Some of what we learned is about better ways to identify lenses that can be improved by adjustment in-house. Of course, like all things, some of what we learned goes under the ‘how could we be so stupid’ category. So this post is a combination of celebrating how great our new testing is and laughing at stupid Roger tricks. Plus, like most of the stuff we do, we learned some things about the lenses that you may find interesting. Let’s start with a single test of a single lens. The computer graphs the test results and then checks six measurements to decide if the lens passes or fails. If the lens passes all six requirements it passes, as this one did. What are those six key measurements, you should ask? 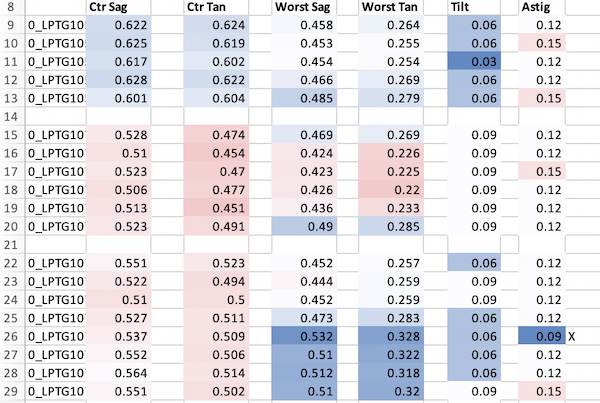 Basically, two are center sharpness (on axis Sag and Tan MTF), two are the worst corner being good enough (worst of the four Sag and Tan Peaks). Next is tilt (the horizontal axis is focus position; if the lens is tilted the four off-axis peaks don’t line up like the lens above; they are spread apart) and finally, astigmatism (if the sagittal and tangential have different focus positions). Every lens is different, so how does the computer decide what’s passing and failing for a given lens? 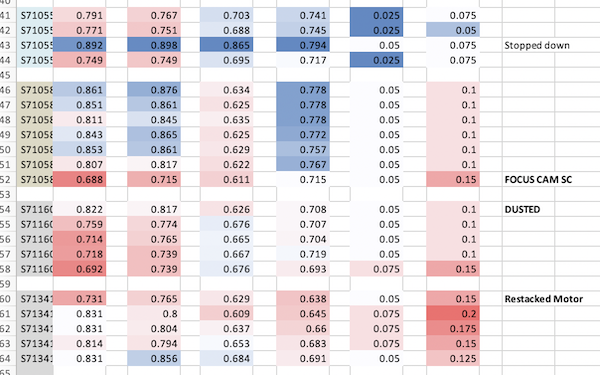 We start by using the MTF and variance data that we’ve published in blog posts for years and plug that in the program. But the program is self-learning. After it’s done hundreds of runs on a given lens, we tell it to recalculate its standards. With several lenses, after we ran a couple of hundred tests, the machine told us our standards were too low. One question I get asked a lot is ‘do lenses get softer with use?’ This type of testing lets us save the numerical results every time a lens is tested so we can look at that. An excel spreadsheet of all the test results for a given lens is really interesting. Here’s a tiny clip from a 1,000 plus row spreadsheet. This sheet was for Canon 50mm f1.2 results; I chose it because that’s a lens that requires frequent adjustment. The empty rows separate three different copies of the lens; each lens tested after each rental. I did a crude conditional format for each column with dark blue being the best, dark red (there aren’t any here) being near-failing or failing. You can see the tendency that we see: a given lens tends to be similar with each repeated test. It’s generally consistent enough so that any change stands out. I can then pull up that lens and see if anything happened to it. You’ve probably noticed the last lens in the table above had a change; it actually improved somewhat in its ‘worst corner’ readings. There’s an X in the column at the time of change. The X tells me one of our techs opened that lens up to remove dust before sending it for testing. Cleaning the dust out doesn’t improve the lens optically. However, with this lens, the elements have to be recentered after dusting the front. Our tech recentered it better than it came from the factory. I’m going to show you a longer piece of the spreadsheet now, and let you scroll down it like I do when I review reports (except mine is over 1,000 rows long). Mostly this is to give you an illustration that a given copy doesn’t change very much over time. Granted this is only a few months, but each test is after the lens was shipped, used, and shipped back. You’ll have to take my word that if I showed you all the spreadsheets for hundreds of lenses over thousands of test runs, this is how they all look. You may notice one other ‘event’ in the ones above. The lens under our first example has a change, and there’s an “A” for ‘adjusted optically,’ after that test. The point isn’t that the adjustment made it better (it did), but rather the lens was tested four times and passed, then failed with about the same results. This is the ‘tightening of range’ that I mentioned earlier. Our program showed us we should hold this lens to higher standards than we were. This next clip is from a different lens. This time I just pulled the problem lenses we found (well, and one problem we created). We’ll start with the top because it’s one that made me go ‘DUH, we should have thought of that.’ That lens didn’t suddenly get better for one test run; the tech didn’t check to make sure the aperture was wide open before testing it. Once would have been funny, but it’s happened a dozen times (out of a few thousand test runs), so Markus is now adding a ‘too good to be true’ outcome to the software. We should have thought of this to start with. It’s important because testing a lens stopped down basically is not testing the lens. Some lenses that are awful wide open look fine stopped down a bit. There was even more ‘we should have realized that’ usefulness in these ‘too good to be true’ test results. We found a high frequency of ‘stopped down’ results in one Cine lens. It turns out that the tech wasn’t at fault, the aperture wasn’t fully opening to maximum diameter when the aperture ring said it was. (It wasn’t a huge difference, for example, a T1.5 was probably set at T1.7 or t1.8 in reality.) It’s an easy adjustment to make, but we had been missing it before we started this kind of testing. The second lens in the set above is really the perfect example of why testing is important. After the test, we emailed the renter and asked if the lens had been dropped. He told us it had but that it had worked fine afterward, so he hadn’t mentioned it. We found a bent focusing cam inside and had to send it off to the service center. The next one still passes (although barely) but is definitely worse since it was dusted. We pulled it off the shelf to readjust it after we saw this. It still passes, so just testing on a pass-fail basis we didn’t notice it. But looking at serial tests, we know it can be made better than it is because it used to be better than it is. The last lens is another example of randomness: it didn’t fail its first optical test but was having AF problems, and one of our techs restacked the AF motor. It’s optically different after that; a bit sharper in the center but with more astigmatism at the edges. Again, it still passes, but disassembling and reassembling made it a bit different. We also have another redundant check that is a benefit of being able to store data for multiple tests. The example below is from yet a different lens. 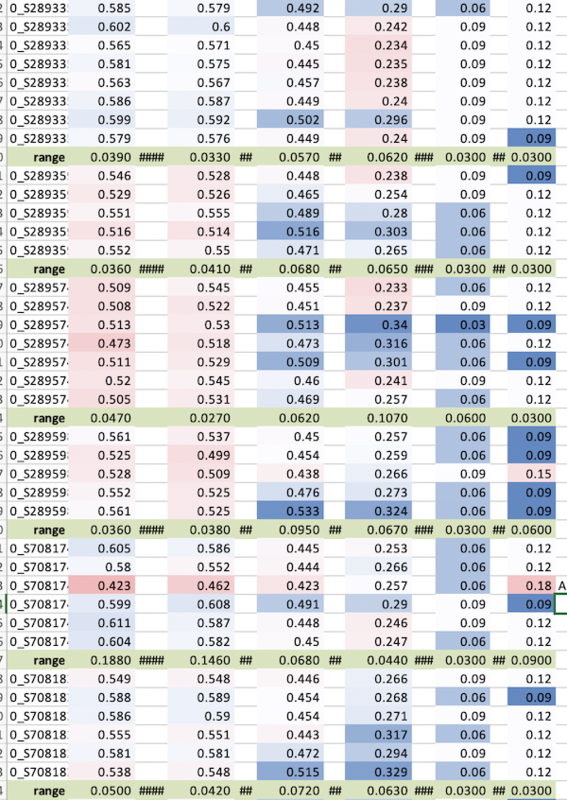 In this spreadsheet, we simply added high-to-low range for each lens (green cells). Remember, the first two columns are a center resolution, the next two weakest corner resolution, then tilt and astigmatism. This lens doesn’t have much tilt or astigmatism so we’ll ignore those. One lens, the second from the bottom, did have a failed result requiring optical adjustment. If you look at the ranges, you’ll see they’re very consistent among all the other lenses, basically less than 0.05 in the center and 0.07 in the worst corner. But the bad results gives a much higher range. While that wasn’t necessary to identify the bad lens, it can help us identify bad test runs, copies that might have a little looseness inside and vary from test-to-test, or a type of lens that just has a lot more variation, which helps us set our standards (more on that in a bit). We can take this a little further in summary reports. For right now, I have to import these by hand, so I’m only showing a few examples. 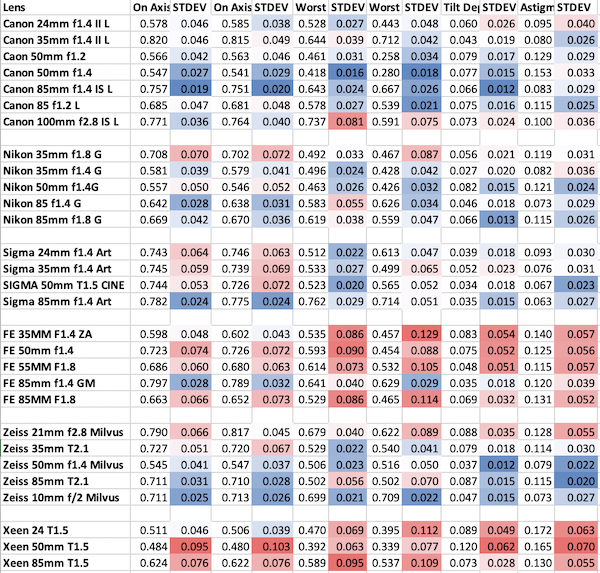 In this sheet, I’ve highlighted the standard deviations for each test on each type of lens, and again colored them by percentiles, with red having the highest variation and blue the lowest. So where you see red, the lens has a lot of copy-to-copy variation, where you see blue, it has little. Please don’t read too much into this; it’s just an interesting demonstration. I’ll be getting into accurate detail in future posts; this is just a preliminary overview. Remember, I have way more data on Canon lenses (600 to 1,000 tests per lens) because we have way more of them. Most of the others have only 100-300 test runs, their numbers may change a bit as more data comes in. The points I’m trying to make aren’t which brands and lenses are best and worst (I’ll make that later). It’s simply to make the point that certain lenses, and to a lesser extent certain brands, have more variation than others. All of our tests simply make certain that the lens passes what its own standards are. If it’s variation is high out of the box, the variation is high. As one example, I’ll show how this confirms something I’ve said for years. The Sony 35mm f1.4 ZA lens, is very consistent for center sharpness. If you get one, center sharpness will be good. The low variation our test shows in center sharpness confirms that. All of the 35mm f/1.4s seem to have a weak corner or side, though, and the red off-axis readings demonstrate that. If you get one, the corners are not likely to be equal. This is similar to what our variation graphs show when we do MTF testing, but it’s easier to compare a lot of lenses this way. I guess my takeaway message here is several-fold. First, having historical data on a lens lets us do more than just ‘pass-fail’ testing. It can give feedback to techs about their repairs. We’re learning that with some lenses, at least, we can adjust optically to better than ‘good enough to pass.’ A year ago I was comfortable we had the best optical testing that anyone had. Now it’s better. Probably the most pertinent point for you guys is that lenses don’t change over time very much unless something happens. They don’t change much with use, but they can change with abuse, even accidental abuse. If a lens gets dropped (even if it seems fine afterward) or repaired, it may well change optically. Another point that I’ll expand on in a future post is for those who spend a lot of time and effort in ‘getting a great copy.’ Some lenses have such variation that you probably will have to go through at least dozens of copies if your definition of ‘great copy’ is ‘near perfect copy.’ If you limit your definition to something like ‘good in the center, I can live with bad corners’ or ‘I don’t mind some tilt’ then you really can find some great bargains. Any chance you will be testing the new Sony 24mm f1.4? Thank you for the added detail of your response. Your tests must take ages even for the ‘rapid’ MTF tests, no wonder you are backed up and unable to offer this service to the public. Thorough takes time even for quick tests. ? Once again, an outstanding article with data and facts. A light in the darkness, and much appreciated. Roger: You deserve an award for this work, or at least a published article in a reputable journal. It’s outstanding, groundbreaking and generally impressive. But perhaps more than that, it’s incredibly generous of you to take the time to write a nice, readable article to show all of your valuable work off (and make us lens nerds incredibly insecure about our gear). I really, really hope you can sell your method to manufacturers. We, as customers, deserve the best; and you deserve a nice couple of millions to roll around in! Thank you for the reply. I had ment how long before you clear the lens rentals inventory. Less than 24 months is interesting. Can you add a ZWO ASI1600MM to your rentals. I wouldn’t mind getting one in a year. We don’t sell the machines, Trioptics GMB does. But we’ve already offered to give our methodology to a couple of manufacturers. You can kind of see what we’re doing over time in the green rows in the spreadsheet. That showed range but we look at SD and other variations. Basically, as we get more and more tests over time we’re looking at any deterioration over time, rather than the noise of random variation (rising and lowering); plus some other math comparing (eventually) every lens 1, 3, 6, 9 etc. month readings. As for repeatability, of course we measure for the test with ‘same sample repeat measurements’, testing a small group of lenses over and over. Makes sense if you think about it but for each lens type (not copy) there are slightly different test repeatability. They’re pretty small, though, and test-to-test variation on a given lens is a few % for the 4 MTF readings. Variation is larger for tilt and astigmatism because the measurements are cruder, and the numbers are less significant. That’s OK fr our purposes since those two measurements are basically either ‘some’ or ‘too large to measure’. Reed, we do keep data on repair frequency, but we only keep lenses for 2 years, so in some ways it’s more about ‘what’s likely to break’ and less about ‘how long will it last’. David, if you’re talking about how long it stays at Lensauthority, it depends very much on what it is. Canon lenses may sell in a few days, Cine lenses may stay there for months. If you’re referring to how long before Lensrentals equipment goes to LA, at most 24 months, but often less (lower demand for an item, etc. may mean selling it sooner). I’ll second this. I’m not normally in the market for renting lenses, but a reliable scientific test process to run my lenses through and get them all serviced if they’re out of spec? Or a way to buy a tested lens rather than “blind” and send it in for validation every so often? Shut up and take me money. It does seem like you are about the only guys on the planet who have the data and the expertise to put such a business together. Obviously only you know whether such a business would be viable, but given the number of people on this thread who already jumped up and down with joy at the possibility, please do have a think about it! In future, what might be the availability of data on a specific lens type, over time? I’m just a duffer shooting B&W film with some Leica M primes. I’ll never see validation of their raw optical performance but I am interested in their mechanical robustness over time because I don’t baby them. My guess would be that rented lenses are treated with a little less care because, hey, they’re rentals and insured. That’s a pretty good petri dish for one’s lens X that is not rented but owned. In any case, another great article. Thanks. Thanks for a great geek article and for the humour you inject in your writings, every article has the chuckle factor. How do you know if a reading is changing due to repeatability errors or because it is actually changed? I’m not suggesting that I doubt your practices but there must be repeatability variation, is it several decimal points to the right or?? Trust me, more than 4 people have read this. So now is the time to jump into Lens Authority, before you’re all sold out in February? How long do you hold stuff until you sell it? I hope you are selling your MTF machines to the lens manufacturers for QA, as well as the data you are accumulating on the cameras over time. They can certainly use your help in their Deming methodology. Just make sure to charge the heck out of your service. In a world you can’t trust vendors such service definitely has a market opportunity. Great “Geek Article” as ever, Roger. Thanks for that – and yes I would appreciate if you would eventually offer “outside work”. Oooh – Lens Authority used lenses. I didn’t put two and two together. That’s a good idea. No complaints on no zooms from my end. I don’t own a zoom, but I could use another extra sharp prime or two or three. Bad pun – you could be like the Cutco for lenses: Free sharpenings for life with every purchase from Lens Authority with extended warranty. This is just quick excel spreadsheets, I wasn’t looking for significant numbers so I left everything at 3 decimal places. The tilt and astigmatism numbers for most lenses tend to be simpler measurements. 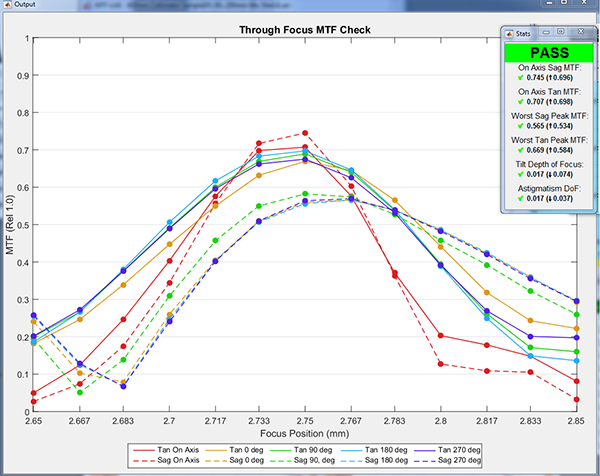 Rather than running on a 0.000 to 1.000 scale like MTF does, those are actual mm of focusing difference. Since the most common focusing range is 0.3mm done in 10 steps, they move in 0.03 increments. Thanks as always for the fascinating look into what you guys do behind the scenes. I noticed that some of the numbers have 3 significant digits, and I always have to wonder when I see numbers like that what the threshold of discrimination is for the system. For example, is it significant that one lens’ number is say 0.001 more than another one’s, or is that within the error bars of the system? Some of the astigmatism and tilt numbers seem to jump by 0.03 unit steps, and that’s always an interesting kind of behavior too. And on an unrelated note, what are the chances that there will be a Z-mount adapter for OLAF? Tom, they’d also be giving up the new lens warranty. You know the simple answer (for most lenses)? Buy a used one from Lensauthority. It’s been getting this kind of testing for most of 2018. To be complete, though, only prime lenses have been in this program this year, not all zooms get this treatment; and we aren’t testing m4/3, Fuji or Pentax yet. And all of that being said, Roger recommends waiting a bit longer. As the article showed, we’re doing better now than we were in March or April. I think it will be January before I say ‘that’s a wrap’. I have read the comments below and know your answer already, but pretty please? I’m sure nicer begging without an evidence-backed argument is the way to win you over. 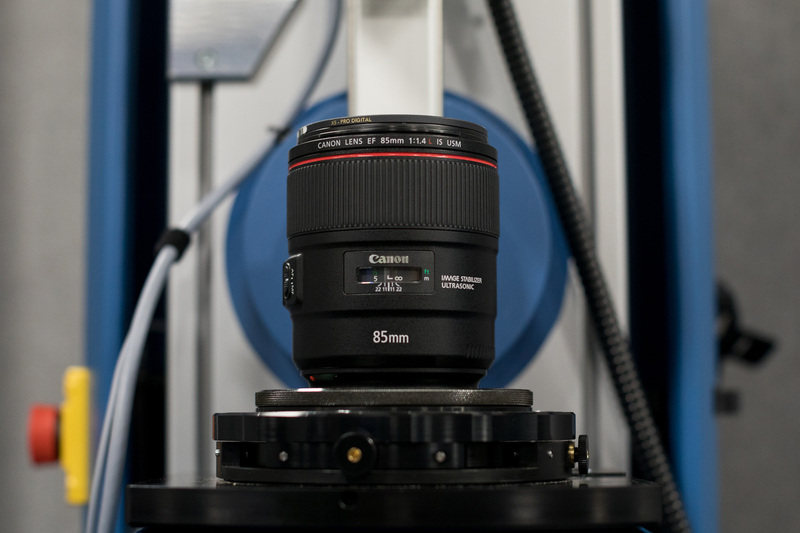 There must be a fair market value of offering outside lens calibration services that could allow you to recruit and hire a whole new team with a second calibration system and have a whiz-bang “Perfect Lens Offering” service. Totally understood. Please try to expand if there’s an opportunity! Would make a lot of us happier about lens purchases. Ketan, see below. We can’t keep up with our in-house repairs, so we can’t take on any outside work. Do you think you would ever start offering a service to adjust lenses that customers have bought themselves from retailers? I’m sure there are others like me who would pay quite a bit for such a service, but not sure if the scale of the demand out there would be worth setting up that system on your end. But really, please offer this. I’m so tired of testing multiples copies of a lens with every purchase and still finding disappointments. Fascinating as always, team! Thanks for this! Unfortunately we have a 2-week back up for in-house repairs. We can’t take on any outside work. Here’s the real question. Can I send a lens to you for calibration rather than sending it to Canon, even if it’s a lens that I own? This is fascinating, but at the same time I’ve always been suspect of Canon’s “in spec” designation when things return from CPS that don’t seem to be very accurate. I feel like I’d trust you way more than I trust Canon. Another fascinating deep dive. Thanks for sharing these data sets with us and providing such thorough analysis. Articles like this are the reason why I only rent from you Roger. I get the idea that making sure what you send out is right comes secondary to the fact that having a lens that is off within fifty feet sets off your “Spidey Senses” and it bugs you along with many of your techs. It’s obvious that you love what you do. Great work. All these Computations hurt my head.